Greetings El Presidente, the Tropico 6 release day is upon us. Build and design your totalitarian utopia and entice cashed up tourists to blow their savings in your luxurious tropical cities filled with iconic landmarks from around the world. Tropico 6 introduces new archipelago-style worlds to build in, so you’re going to have to be clever with bridge and tunnel construction to maintain the scenery while keeping the traffic flowing. With hundreds of buildings, new ideas, and space travel Tropico 6 is shaping up to be the biggest game of the series, and definitely the best looking. El Presidente returns with Tropico 6! Prove yourself once again as a feared dictator or peace-loving statesman on the island state of Tropico and shape the fate of your nation through four distinctive eras. Face new challenges on the international stage and always keep the needs of your people in mind. In Tropico 6 you manage extensive archipelagos, build bridges to connect your islands and use new means of transportation and infrastructure for the first time in the series. Send your Tropicans on raids to steal the wonders of the world, including the Statue of Liberty and the Eiffel Tower. Customize your palace at will and give election speeches from your balcony, to win the favour of your subjects. 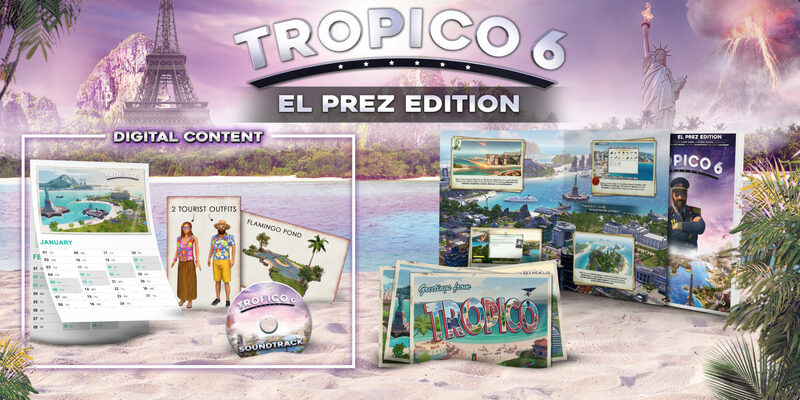 Tropico 6 releases today on Windows PC digital platforms and can be purchased directly from the Kalypso Media store here which includes the El Prez edition that comes with an exclusive palace design featuring a flamingo pond. Alternatively, the game will be available in-store on April 2, and an Xbox One and PlayStation 4 Tropico 6 release will occur at some stage in the coming months.